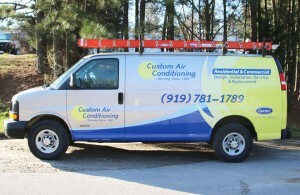 Custom Air Conditioning is a family owned business which was established in 1981 by Jim and Donna as they settled into Raleigh, NC to raise their family. Their youngest son, Richard, working early on as a teenager in the field became very familiar with the trade. After many years of experience in the field, he became hands on with the everyday managing of the office and onsite work duties. Richard received his HVAC degree at the young age of nineteen and his HVAC contracting license shortly thereafter. Richard strives to maintain the small business relationship and atmosphere with his customers and employees. RFM, Inc. dba Custom Air Conditioning - specializing in HVAC Service, Design, Installation & Replacement. Family owned business serving the Triangle since 1981. © 2016. All rights reserved. RFM, Inc.